Juncker basically repeated the same arguments he used with the Brussels press corps a couple of hours earlier. His main message was that the leaks did not reveal anything illegal. 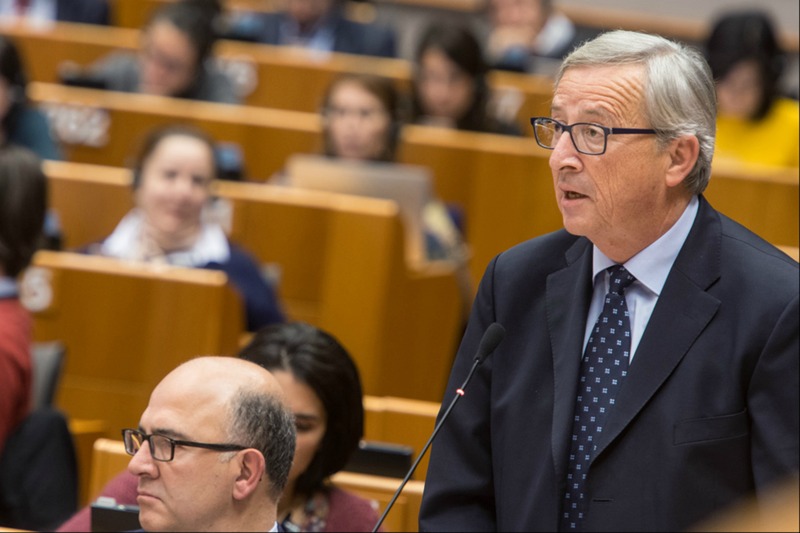 Juncker insisted that there is no conflict of interest concerning the rulings allowing major companies to avoid taxation, which were made when he was prime minister of Luxembourg, currently being investigated by the commission he now leads. The scandal erupted on 5 November, when the International Consortium of Investigative Journalists (ICIJ) published articles based on a review of nearly 28,000 pages of confidential documents, which reveal that more than 300 international companies appear to have channeled hundreds of billions of dollars through Luxembourg and saved billions of euros in taxes. “There probably was a certain amount of tax avoidance in Luxembourg, as in other EU countries. We find this everywhere in Europe, because there is insufficient tax harmonisation in Europe,” Juncker told MEPs. The Commission President also announced that he had proposed to the College of Commissioners that automatic exchange of tax rulings should be made compulsory. Economic and Financial Affairs Commissioner Pierre Moscovici had been charged to draft such a regulation, Juncker said. Moscovici, who was standing besides Juncker, didn’t speak. Parliament President Martin Schulz then gave the floor to the leaders of the parliamentary groups. Following their interventions, it became clear that the three groups that had predominantly backed the Juncker Commission on 22 October continue to back him, in spite of the scandal. EPP group leader Manfred Weber said he was confident that Juncker will resolve the problems that are now on the table, adding that “it is not the EU that failed, but the member states themselves who have made no efforts to harmonise their corporate tax bases”. S&D group leader Gianni Pittella also made it clear he would not back demands for a motion of censure against Juncker. His statement indicated that the centre-left group is giving time to Juncker . “We ask President Juncker to take immediate concrete measures to finally regulate tax ruling and fiscal dumping to achieve a full harmonisation of fiscal policies between member states. First of all, we ask President Juncker and his Commission to adopt a clear and extensive definition and a common set of criteria to identify tax havens. Commission and member states should then refrain from granting EU funding to companies involved in fiscal law infringement. Under country by country reporting, multinationals would finally have to break their information down by country of operation – including in each tax haven. Taxes would have to be paid in the country where profits are realised. This is what we expect from the Commission and what we demand,” Pittella stated. ALDE leader Guy Verhofstadt said the investigation by the Commission must be completed by the end of the year, and deal not only with three countries, but with the problem of tax evasion in general. He also called for a special investigative committee to be set up in Parliament, and asked others groups to support this. “This is also a clear case where we need more Europe – to set up common tax compliance legislation and a convergence code, not general harmonisation, because we don’t know at what level to harmonise,” Verhofstadt said. To this, Juncker replied that investigations would target all countries, and then Belgium, of which Verhofstadt was Prime Minister, and may also have a problem. Kay Swinburne from the conservative ECR group said that further work is needed to clamp down on companies that aggressively seek to avoid paying their fair share of tax. Regarding the allegations made against Luxembourg, she urged the commission to produce findings of their investigation into various EU countries swiftly, and to ensure public confidence that the commission’s investigation will remain impartial. However, Swinburne rejected Juncker’s calls for EU tax harmonisation, arguing that tax competition within the EU helps the bloc to remain globally competitive. Gabriele Zimmer, leader of the leftist GUE/NGL group asked Juncker to explain his actions as a former Prime Minister of Luxembourg, and why he allowed companies the opportunity to avoid tax in his country, thus depleting poorer EU countries of financial resources. Philippe Lamberts, co-president of the Greens group, called on Competition Commissioner Margarethe Vestager to broaden the scope of the investigation, adding that the Netherlands was the same kind of tax haven as Luxembourg. UKIP deputy leader Paul Nuttall called Juncker a hypocrite over tax evasion, and demanded that he resign, or step down, pending an investigation. “The definition of hypocrisy according in the Oxford English dictionary is the practice of claiming to have higher standards or more normal beliefs than is the case. And I don’t think anyone in this chamber could disagree with me today when I say this perfectly sums up the position of the President of the European Commission here today,” Nuttall said. Bruno Gollnisch, of Marine Le Pen’s Front National, accused Juncker of using scandals to get more power. He stated that tax harmonisation is not needed, but that there is a need to make multinationals pay taxes in the countries where they make profits. Gollnish also compared Juncker to Vidocq, a former criminal who became a very effective French police chief in the 1880s. It is not clear if Juncker took this as an encouragement. “leaks did not reveal anything illegal” – this is a moral issue – not a legal one – morally Juncker is unfit to run the EC. Nothing, absolutely nothing he says will change this. It is clear that large parts of the EP lacks the balls to call Juncker what he is… apart from… & I do not believe that I am writing this…. the kippers… christ on a bike it’s come to this – that only the kippers are calling this guy what he is… a bloody hypocrite & absolutely unfit to run the EC. A better recruiting event for euro-sceptics could not be imagined. @ Mike: The Commission President also announced that he had proposed to the College of Commissioners that automatic exchange of tax rulings should be made compulsory. Are you happy with this proposal? Is it moral to trade with a country like China? Considering the impact it has on our economy and the economic and politic reality there … They don’t have any substential labour protection there. It is a kind of unfair competition. Our company will never be able to compete with them on that basis. For me it a scandal to have free trade in this conditions. For me, It is probably legal but completely immoral !!! Mr Juncker said that E.U. states are to blame if they don’t give efforts ! But actually a moral issue would still be the non- commit for corp tax protection to fight against memer-states tax competitivness ! But not in a memorandum but in an constitutional european Act. Morally is who ? I would say all those EU-states Ministers are unfit ! Should the head of the commission seat be empty ? That won’t resolve the problem either ! I understand your angryness but why are you so focussed on Juncker ??!! The Parliament knows very well that this tax bypass rules problem is a national one unless the tax rules will be solved under E.U. level ! You cannot blame the parliament to say – lacks of ball – because of not resign Juncker which isn’t the issue ! The National governements is the real problem ! More companies the better ! Either the E.U. Council makes tax rules federal or THEY are finally to blame and has a moral issue ! Even companies are guilty because of playing the immoral tax rules ! Without a light confederated politics – appropriate rules will for never be existent ! In response to ge041075, nope I ain’t – I’d be happy with his resignation. Apologists for Juncker say that what he did was not illegal & moral issues are irrelevant/subjective. The outcome of what he did (over many years) was the loss of hundreds of billions in tax revenues by other MS in the EU club. The problem is that taxation is now so complex (thanks to PwC & co) that just exchanging “tax rulings” will have little impact. The large companies must be wetting themselves with laughter & Juncker hangs on to his post despite have initiated a fraud against EU citizens on a colossal scale – and still people defend the guy. Utterly utterly incredible. What do you suggest Juncker out? How his resignation would solve the issue of tax competition in the EU? If you were Prime Minister or president of the EC what would you do to tackle tax dodging? I would resign Juncker if he now don’t commit promised tax harmonization !! I would blame even the Parliament because they got a little more power for non-committing ! But i am sick about their memorandums L.B. treaties unless the E.U. urges for a tiny constitutional E.U. values which Europe deserves more than ever to protect citizens (unemployement , lost of companies , etc) due to inter – E.U. – competitiveness . You see Mike as an normal E.U. citizen i want things to be done right for everyone and i don’t defend Juncker but i blame the failure of the governments! Still 7 Years Europe has basically done nothing besides Austerity + unemployment , the 600 bill € for youth unemployment thrown through the window AKA Nothing has been tackled. If a tiny e.u. constitution based on EU. protection were implemented people would pay a lot more attention on on this Union ! NOTHING happened ! Well let’s see what this coming days of the next 5 years will be ! Otherwise i see no other issue than to vote something else (I mean either this or that but not this failed hybrid system) ! Without a protected at least constitutional reform – Unfortunately – the Eurozone is and remains forever a failed Utopia ! In response to ge041075. 1. Companies should pay taxes in a given country (that is not their home country) partly on the basis of their economic activities. If they do not (e.g. Amazon, Apple, etc) then access to “services” would be withdrawn, e.g. police, law courts etc etc. 2. Failure to pay tax would also lead to loss of Limited liability status and employees and share holders would become directly and personally liable, without limit for the actions of “their” company. There – solved, easy. Don’t you fear double taxation? If a firm has cross countries operations in which country should it pay taxes? Imagine Nissan. It produce cars and most of them are export in the EU. The taxes should be paid were the cars are produce or where the cars are sold? 1/ Firms owning foreign subsidiaries, can be simultaneously resident in multiple countries. 2/ Firms can transfer of goods, Intellectual property rights, and services, among its subsidiaries. 3/ Firms resident in one country can make most taxable gain (earnings, profits) in another. 4/ Firms may be obliged by domestic laws to pay tax on that gain locally and pay again in the country in which the gain was made. 5/ Firms resident in one country exporting to another may benefit extensively from the domestic public infrastructure. Frankly, I don’t care if a firm operating in the EU but also in countries outside the EU has to be subjected to additional taxes in each of the third countries. However, a common tax for the entire territory of the EU and collected by the EU would be acceptable for me. Mainly because of the fact that goods (not sure about services but I suppose the same logic applies there as well) exported from a third country and imported into one of the Member States should be allowed to circulate freely in the entire EU. It’s time we started thinking as a single entity in more domains. PS. I have yet to learn more about tax law so my opinion is based purely on moral reasoning. In response to ge041075 and the others, as part of my formal education, I studied international taxation. I am familiar with, for example, transfer pricing – a nice little earner that companies have been abusing for decades – I know ’cause I saw it first hand. I have minimal sympathies with large companies that have been gaming the system for decades, ably assisted by those con-artists PwC & co. It is time to re-set the clock. Passing bits of paper between EU MS is not the answer. Looking at a companies operations in a country and then assessing the profits it should make on those activities is the first step. I know all about double taxation treaties and all the rinky-tink stuff that can do (“co-ordination centres were – once upon a time the flavour of the month – that was a nice little “washing machine” until Luxy’ & the head gnome got their act together. Please, don’t give me the hand wringing stuff – oh look its unfair – large crops have been taking the piss on taxes since the late 1970s – time for some attitude adjustment. I agree that (some) companies have been abusing for decades. Perfectly true. Double taxation treaties are a great idea. The pb is abuse. Getting rid of them would be a bit simplistic anwer. The pb is that “PwC” as you said, managed to find the loopholes. I don’t think it is that easy to find rules wich are not too strict but easy to enforce. Economic performance activities are a first step. Then you need to take into account the business structure/model of the company. For instance, you cannot tax food industry the same way than drug industry. “”PwC” as you said, managed to find the loopholes” if only it was as simple as that…. PwC and the other “little helpers” have “helped” tax authorities formulate rules (they “helped Luxy when Juncker was there) – that’s the problem – they not only exploit tax loop holes – they make sure the loop holes are built into tax legislation in the 1st place. That is why this particular augean stable needs some serious reform & not tinkering at the edges – as proposed by Juncker & Co (doubtless with help from PwC & co). The entirety of it stinks to high heaven. Meanwhile, the peasants continue to pay their taxes as usual – & the companies laugh all the way to the bank. But ? Why wait ? Then GO for E.U. tax rules harmonisations ! IF not then don’t blame!